Designed to guard your PC from unauthorized access, Simple Desktop Lock's security measures are easily defeated. The perfect answer to physical security of your desktop. Despite the name this application is in no way simple. Using multiple methods to ensure a stable secure lock this program also offers many stylish options for users. Unlike using the average dull windows login screen to lock your desktop, you can choose between four different styles of protection (solid color, picture, movie, flash). You can not only visually secure your desktop, but you can also play background music. There are various applications out there that promise to keep your desktop safe while away from your desk. One of them is Simple Desktop Lock, a very easy to use application that does exactly what its name suggests: it locks the Windows desktop and blocks unauthorized access. One of the best things about Simple Desktop Lock is that it is safely addressed to all types of users, as beginners should have absolutely no problem trying to figure out how to use it since everything's so intuitive. Configuration is just minimal, so users are only requested to pick a password to lock the computer, but also set up the style of the lock window, which can be either a solid color, a picture, a movie or a Flash movie. Additionally, Simple Desktop Lock enables you to use a background sound, but also to disable some important bypass methods such as Taskbar, Task Manager and some critical key combinations, including Alt+Tab, Alt+Esc and Ctrl+Esc. While everything works okay even on Windows 7 and 8, there's one thing to be mentioned here. Simple Desktop Lock provides no information on the way you can unlock the computer, so may end up with a completely locked system that has to be restarted to close the application. 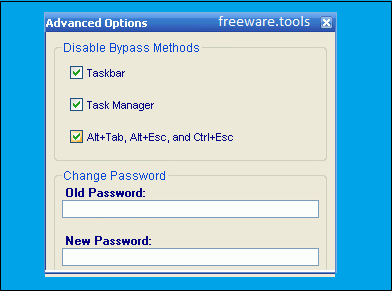 This was tested on Windows 7 and 8, and besides the fact that there was no way to unlock it, Simple Desktop Lock still allowed to work on the system, but without the aforementioned bypass methods. In other words, there's no access to the Start Menu, the Taskbar or Task Manager, which are indeed the easiest ways to close the app.